Mathematically, roulette isn’t the best casino game to play if you interested solely in making money. The house has a large edge on most of the bets, which reduces your chances of winning. Having said that, roulette has always been – and continues to be – popular with gamblers. People like the game because it’s easy to understand and simple to play. It’s also relatively slow-paced. Unlike blackjack, where you can play hundreds of hands per hour, you’d be hard-pressed to get through 100 spins of a roulette wheel in that time. There’s also a sense of excitement that builds with each spin. As the ball circles the numbers, you can’t help but watch with anticipation as its travel around the wheel slows. And then, the ball bounces between the numbers before finding its final resting place. That process happens each time the wheel is spun. It’s no wonder roulette is so popular. It’s like a series of mini-cliffhangers! Below, I’ll share my top ten tips for playing online roulette. I can’t guarantee you’ll win money. In fact, there’s a good chance you’ll lose over time due to the house’s edge. But I can show you a few strategies for making your bankroll last, and with a little luck increasing its size. The upside of making these wagers is that they pay out a large multiple of your bet – for example, 35:1 for a Straight Up bet, 17:1 for a Split bet, etc. Of course, the higher the payouts, the less likely you’ll hit the numbers you need to win. The drawback of making these wagers is that you’ll receive a lower multiple of your bet in the event you win. For example, you’re paid even money (1:1) on successful Red/Black bets, Even/Odd bets, etc. On the other hand, you have a much better chance of winning. Given the above, Tip #1 is to stick to the outside bets. If fact, stick to those that pay even money if you’re learning how to play the game. Once you gain experience and develop a sound bankroll management strategy, try the wagers that pay 2:1 (i.e. Column bets and Dozen bets). American roulette has 38 numbers on the wheel, including a single zero (“0”) and double zero (“00”). 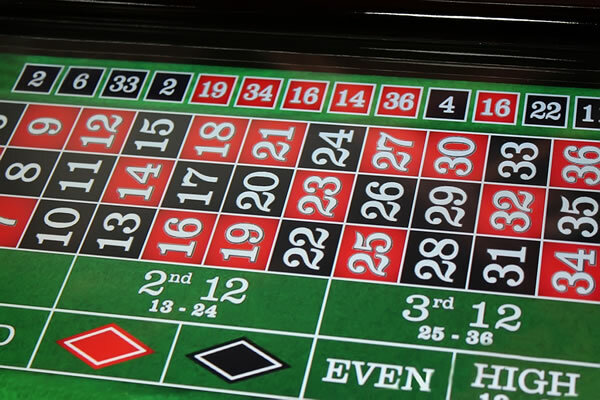 European roulette only has 37 numbers; it does not include a double zero. That disparity might seem insignificant. But it has a major effect on the house’s edge. The edge on American roulette is 5.26%. The edge on European roulette is only 2.7%. If you’re going to play roulette, play the European version. There’s another reason to do so that we’ll talk about in a few moments. Technically, you don’t have to know anything about roulette odds to have fun playing the game. But knowing them will reveal why some bets are so much better than others. And in the event you want to throw some of your chips at a “hail Mary” wager (for example, a Straight Up bet on 5), you’ll have reasonable expectations about the outcome. Below, you’ll find the odds of winning specific bets on both American and European roulette. Notice that your odds are better with the European version of the game. This rule is only used in European roulette. It places your even-money wagers “in prison” in the event the ball settles in the “0” slot. The money you’ve wagered is then carried over to the next spin. If you win the next spin, you receive your money back. If you lose, you lose your money. Suppose you bet $10 on black (an even-money wager). The spin with the ball settling on “0.” In American roulette, you’d immediately lose your bet. However, the “En Prison” rule used in some versions of European roulette puts your $10 “in prison.” If the next spin ends up on black, you receive back your original $10. If it ends up on red, you lose the $10. The “En Prison” rule may seem like an inconsequential feature, but it further reduces the house’s overall edge. A number of roulette betting systems are commonly used by gamblers in an attempt to “beat the game.” The most important thing to remember is that none of these systems can guarantee success. For example, consider a progressive betting scheme where you double your bet after each loss (known as the Martingale system). The idea is that doing so gives you a chance to quickly recover your losses. All it takes is a single win. In reality, “doubling down” is likely to decimate your bankroll. Remember, the house has an edge on every bet. Hence, the only “player” guaranteed to win over the long run is the casino. That’s not to say betting systems are without value. Some are useful because they promote discipline. But don’t expect them to help you win over the long term. That’s a mathematical impossibility. Column betting in roulette is exactly what it sounds like: instead of betting on red vs. black, even vs. odd or high vs. low, you bet that the ball will settle on a number found in one of the table’s three columns. Recall that column bets are outside bets, the type you should focus on. But unlike even-money wagers, they pay out 2:1. That gives you an opportunity to boost your bankroll more quickly. Of course, the odds of winning a column bet are lower than the odds of winning a red vs. black bet (32.4% versus 48.6%, respectively). But if you’re willing to assume a bit more risk and don’t want to make inside bets, column betting is a good option. I recommend trying out different betting strategies. For example, start with an initial bet of $5 and increase each subsequent bet by $5 each time you win. Doing so will allow you to leverage winning streaks. Once a streak ends, start again with a $5 bet. It’s easy to get carried away when playing roulette. That’s especially true if you’re playing online since you can make successive bets with a click of a button. For that reason, it’s important to establish a loss limit for yourself before you log on to play. Your limit will depend on the size of your bankroll and the level of risk you’re willing to accept. For example, let’s say you have a small bankroll ($100) and are a relatively conservative gambler when it comes to risk. Don’t just play roulette until you’re in the mood to do something else. That’s how bankrolls are lost. Instead, set a limit on the amount of money you can stand to lose each night. Commit to walking away from the game if (or when) you hit your limit. You can always return tomorrow, when you might have better luck. It’s tempting to risk large sums on even-money bets. Who hasn’t dreamed of betting $1,000 on black and doubling their money with a single spin of the wheel? But that’s the siren call of every gambler who has lost his bankroll (and grocery money). Resist the temptation to make big wagers. Be conservative with your cash. Bet small amounts and take your time in building your stash. Leverage winning streaks by increasing winning bets by a predetermined multiple (for example, $5 as explained above). When you lose, don’t chase the loss by doubling down on it. Go back to your initial small bet. Remember, the house’s edge guarantees you’ll lose over millions of spins. But with a little luck, you can enjoy small winning streaks. In the event you manage to double your money, pull some of it back to “lock in” your winnings. One of the greatest advantages to playing roulette at reputable gambling sites like Bovada Casino and Slots.lv is that you can do it without putting your own cash at risk. Both sites allow you to play for free. They’ll give you $1,000 in practice money that you can use to learn the ropes. Once you’re familiar with the different types of bets, along with the probabilities of hitting the numbers you need to win them, you can start making real-money wagers. Bottom line: you’re in control. You dictate the pace of the game. You choose how much money to risk (minimum bets are only $1). You decide when to graduate from free-play to making real-money bets. The worst thing you can do is choose a dubious gambling site with a spotty track record. It won’t matter how much money you win playing roulette if you’re unable to withdraw your winnings. Throughout this site, I’ve recommended a small number of online casinos that come with proven track record of legitimate games, responsive support and trouble-free withdrawals. The two casinos I recommend for playing online roulette are Bovada Casino and Slots.lv. Visit both sites today. Take both for a test drive. You’ll find that once you start playing at Bovada and Slots.lv, you won’t have any reason to look elsewhere for your favorite casino games.